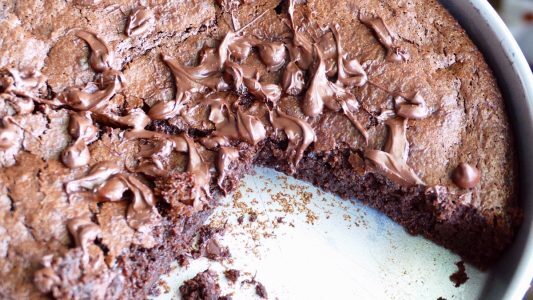 This formula for sourdough brownies is now world famous. It’s a favorite in my groups on Facebook (Perfect Sourdough and Bread Bakers and Artisan Baked Goods). I gave a corporate live workshop on making these brownies with 90 students! We had so much fun! 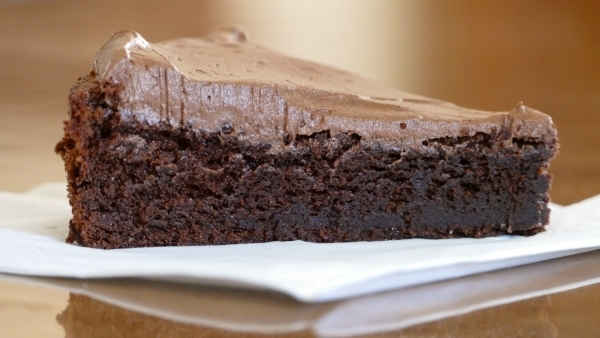 You can check HERE for how to make the brownies into a double layer brownie cake. This formula is quick, easy and tastes terrific! Sourdough starter @ 100% hydration – 200 grams (allow it to ferment 10-12 hours for easier incorporation, also see comment below). 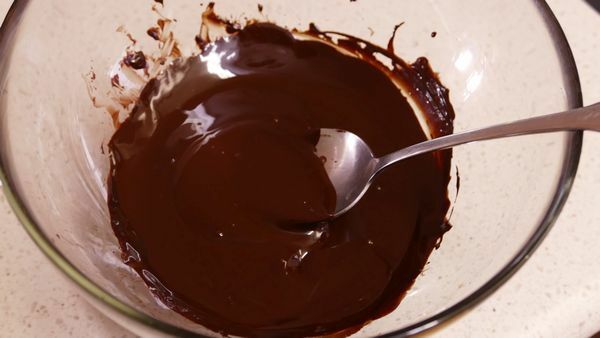 Melt the chocolate and butter in the microwave for about two minutes. 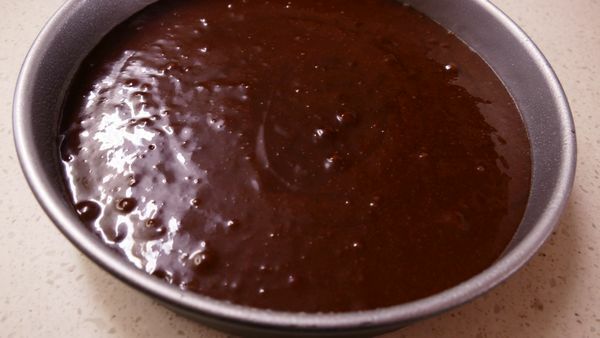 Give it a good stirring so the chips fall apart and the butter and chocolate meld together. 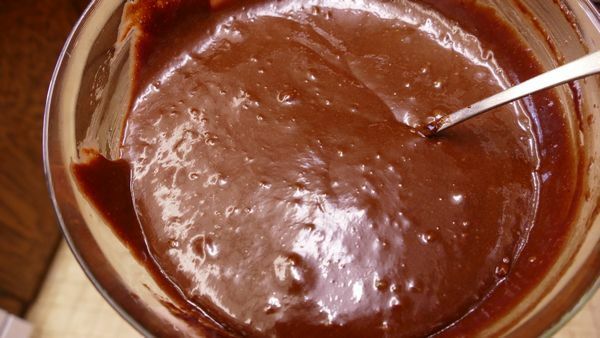 There will be a moment when the chocolate tries to stiffen but don’t let that deter you, stir vigorously until the mixture turns smooth. Add the sugar (don’t cut down the amount) and stir in. Then add the vanilla extract, eggs and soda. Whip all ingredients together. Add sourdough starter (hint: if you use a bit less sourdough, your brownies will be chewier, denser.If you use the 200 grams it will be a bit cakier). An average amount would be 175 grams of sourdough. So use anywhere between 160 grams to 200 grams, choose depending up what you like, denser or cakier. Mix just until it comes together and no more. 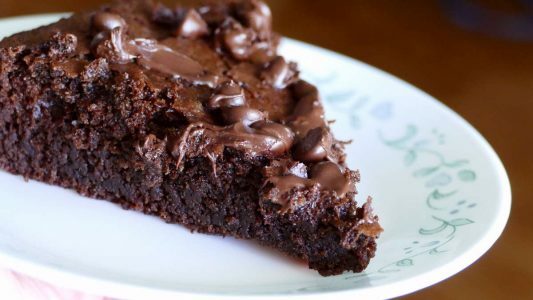 You could add other additions like walnuts, dried cranberries, more chocolate or white chips, chunks etc. Pour the batter into an oiled pan about 9 ″ in diameter. Bake at 350F/176C for 25 – 30 minutes (you will need to bake longer if you added extras like nuts, more chips etc). 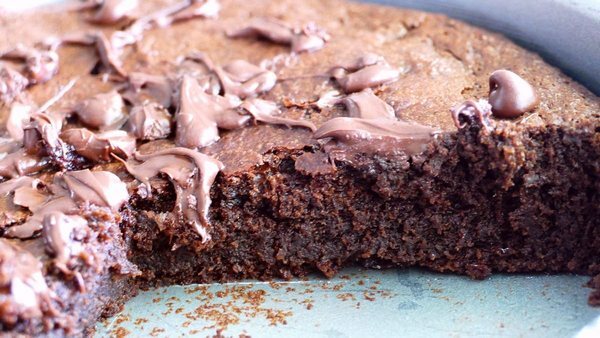 Do not open the oven door or move the pan until after the first 20 minutes goes by or your brownies might sink in the middle after cooling. Check often after 20 minutes, it’s critical NOT to overbake. 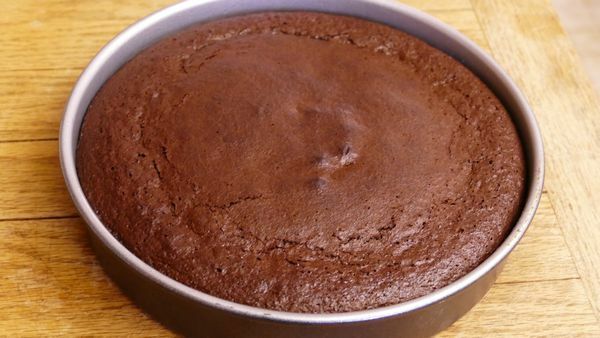 The brownies are done when a knife or toothpick inserted in the center slides out clean. When the brownies come out of the oven they will be puffed up but will shrink after they cool a bit. Slice when you can no longer stand it and enjoy! 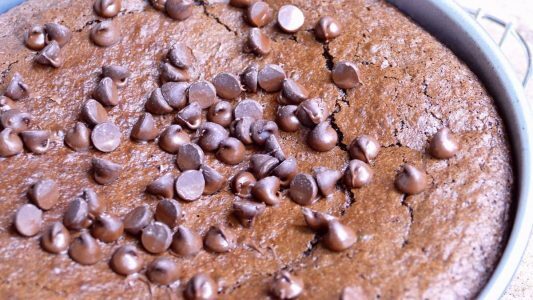 I couldn’t get the first one out of the pan without it falling apart since these brownies are so tender. They firm up more once they are cooled. Interested in taking a course to learn to bake real sourdough? See here. For up to date information on what’s going on with the celebration join my newsletter.